Take a look below at our video which shows a full year at Ghyll Royd School and Pre-School. Starting from September first of all, the video moves through a full school year all the way to Summer. We love this video because it shows a small glimpse to life at Ghyll Royd and all the brilliant things pupils get up to each day. 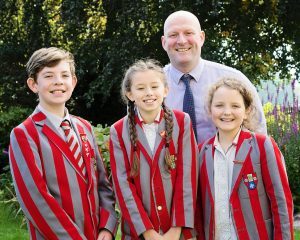 We are looking forward to welcoming new and returning pupils to school on Wednesday 5th September 2018. This year we have planned an exciting range of trips, lessons, activities and events for all! We hope to continue and improve on our successes in sport, art, music, drama and academic subjects! In the 2017-18 school year, we celebrated many brilliant achievements. These achievements include reaching gold status due to our eco-friendly outdoor classroom in the Green Tree Schools Awards; winning the Ilkley Carnival cover competition for a second year; celebrating a 100% pass rate in the Year 6 SATs and also some brilliant results in the Secondary School Entrance Exams. Children enjoyed exploring new subjects including Digital Art, Pottery, Textiles, Bushcraft and also Drama. Trips to Harlow Carr Gardens, Dearne Valley, Pizza Express, Leeds Bradford Airport etc. were thoroughly enjoyable and educational. Headteacher Mr Martin hopes you have all had a brilliant Summer break and are looking forward to returning to school! We are certainly sure that this year will be another brilliant one! We hope you enjoy the video. Furthermore, if you are interested in opportunities available for your child, book a visit to see us today.